The scapula-pull bar flow is a great way to work on increasing the success of your pull practice without actually performing a pull-up. Make sure you don’t miss the video above. I started this flow with a close grip variation of the arch hang pull up. Like the shoulder width version of this fantastic back exercise, the close grip trains the scapula to better retract and descend in order to get a better strong chest to bar pull-up. 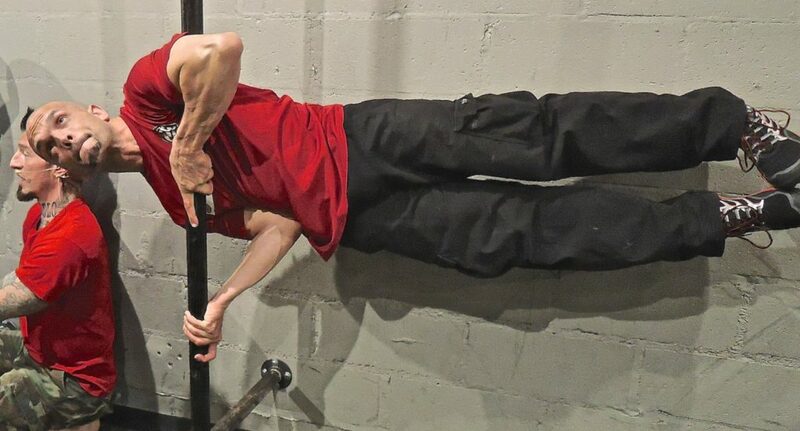 The result of this practice will enable a stronger pull-up at the top of the bar. This helps to eliminate the common mistake of rounding the shoulders at the top of the bar. An added bonus is better height on the pull. One of the key points is to actively keep pressure on the bar by mimicking bending the bar in between your hands. The next part of the flow moves to single arm play. Instead of going to a complete dead hang and swinging side to side, here I added in a single arm scapula pull-up with a wide reach. Begin with a dead hang. Do not use momentum, slow yourself down by using the scapula pull up as described in the arch hang (minus the arch). Reach above the bar and attempt to place the hand on it instead of actively grabbing for the bar. This will add a dimension of discipline to your bar play! The great Phil Dunphy is wise when he stated “Slow is Smooth, and Smooth is Fast! Repeat this as much as you want, but be mindful of fatiguing lats and the small muscles of the grip. A Certified Strength and Conditioning Specialist, a Certified Personal Trainer with the National Strength and Conditioning Association, a Animal Flow Coach, a Trainer through the Russian Kettlebell Challenge (RKC), Progressive Calisthenics Coach (bodyweight training), and TRX Certified Coach. Over the last 15 years, George has been a successful varsity track and field coach, working with athletes to reach district and state championships. He is trained in the art of Jeet Kune Do (JKD) and recently started his new athletic adventure in Parkour. I have a belief that less is more with training. With my clients I push to them the importance of calisthenics and movement. Our own bodies alone make up the gym that we need to use the most. That being said, I believe that through movement/calisthenics we can find a great carry over to other areas of training, kettlebells, track work etc. My idea of movement/calisthenics does not fall short of only using the bar or gymnastic rings. I try to look outside the box, using stairs, hills, walls, handtrucks, hard wood floors. My ideas might seem to some as “unconventional” but my workouts always can answer the question of why and what will it benefit. Movement heals, which is why as we age it is the upmost importance we train to play! George Corso is Co-Owner and Personal Trainer at FORZA in New York. If you want to see more bodyweight training articles from George on Cavemantraining speak up below or on this post on facebook, also the place to ask any questions you might have. DEAD LIFT ↝ Beware, this is controversial! What Is a Full-Body Lock-Out Movement Standard?